For true football fans, the NFL season never ends. With the 2018 season now officially in the record books and the Lombardi Trophy residing back in New England after a one-year hiatus, it’s time to focus on roster building for 2019 and beyond. The start of free agency coincides with the commencement of the 2019 league year on March 13th, as teams can start signing veterans from other teams or let their own players test the waters. 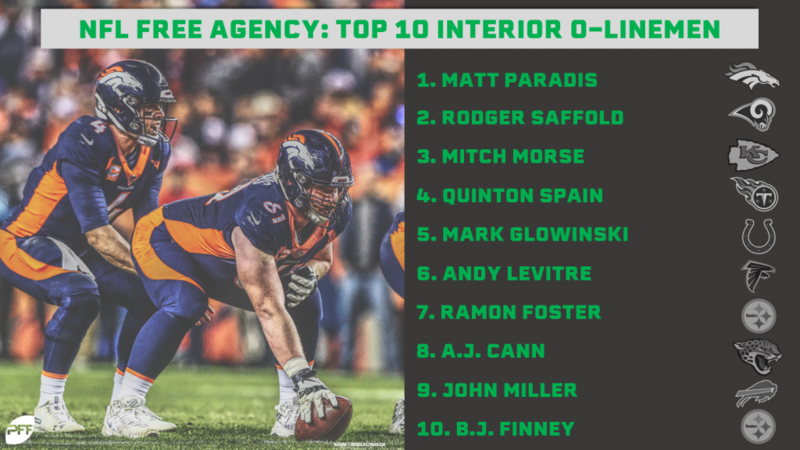 Let’s dive into the top 10 interior offensive linemen set to enter free agency in 2019. Paradis is in line for his first big payday after playing out his sixth-round rookie contract. He has easily exceeded that sixth-round label thus far with four consecutive seasons graded above 74.0, highlighted by a 90.2 overall grade in 2016 which ranked third among all offensive linemen regardless of position. Before breaking his fibula this season in Week 9, he had the second-highest grade among centers at 79.0, trailing only Jason Kelce. He offers an immediate upgrade to tighten up the offensive interior on nearly every NFL team. Saffold was drafted by the Los Angeles Rams in 2010 and has given them nine seasons of consistent play since. This past season, Saffold helped anchor one of the top offensive lines in the league, with the ninth-best grade among all guards at 72.8. Entering his age 31 season, Saffold still has plenty to offer a team. Like Paradis, Morse is a center ready to hit free agency off his rookie contract. He doesn’t quite have the track record that Paradis does (hence his lower spot on the list), but he has shown the ability to succeed in the NFL, particularly in pass protection. This past season, Morse allowed just five pressures in 534 pass-blocking snaps, and not one of those pressures was a sack. In fact, he has not allowed a sack since his rookie season in 2015. After playing just under 400 snaps as an undrafted free agent rookie in 2015, Spain has played over 800 in each of the past three seasons. He followed an excellent 2016 campaign – where he graded at 84.2, seventh among all guards – with two seasons that were closer to average and that did not live up to that mark (66.9 in 2017 and 62.3 in 2018). It’s been his run blocking that has been the culprit of the dip, falling from 80.8 overall in 2016 to 62.4 and 57.3 in the past two seasons. Despite that, Spain has been a serviceable starter and has proven he has the upside to be among the top guards in the league. Glowinski has bounced from starter to reserve at the start of his career, but it appears that he’s cemented himself as a starter with his play on the Indianapolis Colts’ new and improved offensive line this past season. He didn’t take over as a starter until Week 6 this season, but he went on to record a respectable 68.9 overall grade over the rest of the season, ranking 17th among 77 qualifying guards. If not for the fact that Levitre will be 33 this upcoming season and is coming off of two seasons that were shortened by a triceps injury, he would find himself much higher on this list. From 2010 to 2016, Levitre played at least 900 snaps and recorded an overall grade of 70.0 or higher each season. If he can put the injuries behind him and return to that form, whichever team he signs with will get one of the better veteran guards in the NFL. Foster has been the model of consistency and a fixture on the Pittsburgh Steelers offensive line for the past nine seasons. His 8,715 snaps over that span are more than any other guard in the NFL. Foster had an uncharacteristic down year in 2017 but responded with an overall grade of 69.1 in 2018 that ranked sixth among 37 qualifying left guards. 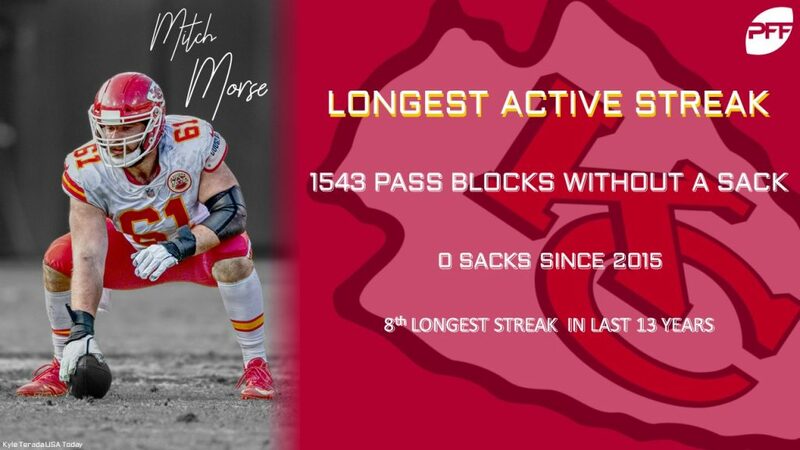 If he doesn’t end up returning to the top offensive line in the NFL this past season, his services will surely be sought out around the league as a proven veteran starter. Cann isn’t the most exciting of options, but he is coming off four consecutive seasons with 800 snaps played with season grades of 60.0 or above. Unfortunately, his worst two single-season grades have come in the last two years (61.3 in 2017 and 60.6 in 2018) after showing more promise over his first two seasons (69.6 in 2015 and 72.6 in 2016). Any team looking to sign Cann will hope he picks back up where he left off in 2016 rather than his more recent play. After playing only four games and being benched for Vladimir Ducasse in 2017, Miller returned to a starting role with the Buffalo Bills last season. At just 25 years old, Miller offers teams a younger option than some of the names on this list, but also an option that hasn’t yet broken an overall grade of 70.0 in a season. This past season, he was only charged with one sack in 529 pass-blocking snaps, however. Finney is probably the most unknown of the commodities on this list after three partial seasons in which he has been stuck behind Ramon Foster, Maurkice Pouncey, and David DeCastro. When he has played, though, he has been steady and reliable, grading at 72.8 in 2016, 66.4 in 2017 and 71.5 in 2018. In the last two seasons, Finney has allowed just five pressures in 234 regular season pass-blocking snaps. That’s a track record that indicates he’s deserving of a starting role somewhere in 2019.